August 20, 1013: In violation of the national legislation the Belarusian authorities try to close down a local organization of the Radio and Electronics Industry Workers’ Union (REP), an IndustriALL affiliate in Belarus. On 5 August 2013 the trade union REP received a notice from the District Executive Committee of Borisov about revocation of registration granted to its local organization in Borisov. The notice was received one month after the union REP sent a request to the Committee asking to help them to find any kind of premise in the city of Borisov in order to place REP local office and perform their statutory activities. Unfortunately, for unclear reasons the owner of the building, where the office of the union used to be located previously, refused to provide the legal address to the organization and notified about this fact the Executive Committee. However, the owner failed to inform the trade union about this decision. In accordance with the national legislation in Belarus every local union organization has to be registered by the local authorities. Such a registration is granted under condition of a legal address, which is given based on the location of the trade union organization. The local organization of REP in Borisov city was registered by the Borisov District Executive Committee on February 2007. In fact the possibility to revoke registration is foreseen by the law, but the reasons listed by the Belarusian legislation do not contain any time frame for change of the legal address and can’t be the reason for revocation of registration of the local union. In this particular case the illegal decision to revoke the registration of the local union is in violation of the International Labour Organization (ILO) Convention 87 Freedom of Association and Protection of the Right to Organise ratified by the Republic of Belarus. This is not the first case when Belarusian authorities interfere with the internal affairs of trade unions. 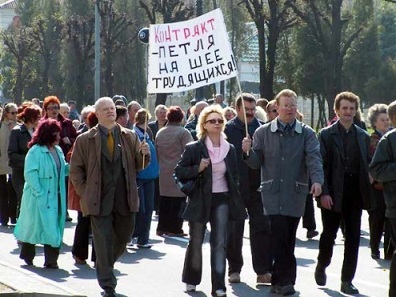 As a matter of fact the violations of trade union rights in Belarus became subject to constant consideration by the ILO since 2000, when Belarusian trade unions submitted a joint complaint against violation of their rights. Several times Belarus was considered as a special case, but so far the practice to interfere in union affairs still preserves. The IndustriALL Global Union addressed to the administration of the President of the Republic of Belarus, Ministry of Justice and Borisov District Executive Committee demanding to abolish the illegal decision revoking registration and stop repressions against the trade union REP and its structural units. Moreover, IndustriALL appealed to the authorities of Belarus to start fulfilling their country’s obligations in face of the ILO and respect workers’ rights to join trade unions and perform trade union work without interference of bodies of authority. IndustriALL calls on supporters to express solidarity with the trade union REP and to send letters of protest to Belarusian authorities. The protest can be sent through a special form published on IndustriALL’s website by clicking here. August 20, 2013: Mass dismissals have taken place at Rio Tinto operations in Mongolia at OT LLC and in Madagascar at QMM. IndustriALL strongly condemns the company’s behaviour and total lack of respect for workers’ rights. Since the Investment Agreement with the Government of Mongolia was signed in 2009, IndustriALL Global Union and its affiliates have been closely following Rio Tinto’s $ 6.6 billion Oyu Tolgoi mine investment. According information received, Rio Tinto is reported to be violating human and trade union rights and damaging the environment in Mongolia. Inspection reports produced by the Ministry of Labour confirm that Rio Tinto is in breach of national and international laws related to the fundamental rights of its employees. Different verdicts issued by district and city level courts confirm that Rio Tinto is violating workers’ rights contrary to the provisions of the national Labour Law. Recent information regarding Redpath Mongolia confirms the general picture that the company building the underground portion of the mine handed notices of termination to workers in execution of a decision by the Oyu Tolgoi LLC’s board of directors. The decision to dismiss 1700 workers is apparently over a disagreement about revenue sharing of the mine with the government of Mongolia. Turquoise Hill Resources, a subsidiary of Rio Tinto, announced on August 12, that until “matters can be resolved with the Mongolian government and a new timetable has been agreed”, the funding and development of the mine’s underground expansion would be delayed. says IndustriALL general secretary Jyrki Raina. IndustriALL Global Union and its affiliates with a presence at Rio Tinto operations worldwide have created a Global Network with the main objective to highlight and combat these violations. August 19, 2013: Arrested strike leaders at Suez Steel, Amr Yusif and Abd-al-Ra’uf, were released after an intervention by the Minister of Manpower and Labour, former president of the Egyptian Federation of Independent Trade Unions (EFITU), Kamal Abu Aita. Meanwhile, the dispute over the implementation of the collective agreement continues. Disputes at Suez Steel, a private sector company employing 2,200 workers on contracts and another 2,000 day workers, date from the signing of a collective agreement in February 2012. The agreement includes provisions to pay workers a profit-sharing bonus, and agreed a pay structure, health care and bonuses. The present dispute is about the implementation of a number of provisions in the agreement, most importantly the profit-sharing bonus. 12 workers were stopped from working and the employers filed police reports against them. Management refused to answer workers’ demands, saying they must return to work before negotiations could begin. When the strike continued, police arrested two of the strike leaders and the army surrounded the factory. Following the arrests, the striking workers tried to block a key highway from Suez to Ain Al-Sokhna, but were prevented from doing so by the Egyptian army. The workers have now been on strike at the factory in Al-Ataqa industrial zone in Suez for three weeks. Security Forces forcibly dispersed a sit in on factory premises by strikers on August 12 with a level of violence used that caused strong criticism of their actions. Last week, the workers’ leaders and the recently appointed Minister of Manpower and Labour, former president of the Egyptian Federation of Independent Trade Unions (EFITU), Kamal Abu Aita met in Cairo. IndustriALL Global Union Consultant Ahmed Kamel, in Cairo to hold a number of training courses for representatives of the new independent trade union structures, joined the discussions. The discussions led to the release of the two arrested strike leaders and the minister further agreed to pay a month’s salary for the workforce of the factory from the Emergency Fund of the Ministry. However the dispute remains at deadlock as the employer continues to insist that workers must restart work before any negotiations take place. Workers’ leaders argue that they cannot ask their colleagues to start work without having a written agreement and payment of the delayed wages. 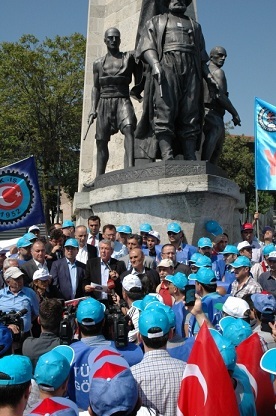 August 15, 2013: IndustriALL Global Union’s Turkish affiliate Textile, Knitting and Clothing Industry Workers’ Union, Teksif, has gone on strike as of 15 August after sectorial level negotiations with the Turkish Textile Employers’ Federation have failed. The old agreement expired on April 1, 2013. The strike covers 12,000 workers in some thirty major textile and clothing producers, including Altinyildiz, Bahariye Mensucat, Vakko, Ak?n Tekstil, Kordsa, Karsu, Levi-Strauss, ? ?bir, Sökta?, Orta Anadolu, Yünsa ve Saray Hal?. With the combination of members of other two unions, Oz Iplik-Is and Tekstil who are also members of IndustriALL Global Union, the strike relates to around 20,000 workers. According to the information provided by Nazmi Irgat, President of Teksif, the union has taken strike decision because of intransigent attitudes of the employers’ organization on wage and wage related matters. “We began to negotiate with very good-will decent wages for our members, however because this process has been put by the employers in a way not leading to the solution, we have arrived at a point of end of the words,” said Irgat. Average gross salary of Teksif members is reported to be around 1,165 Turkish Liras (€ 450), and 55 per cent of the workers in the sector earn legal minimum wage which is 978.60 Turkish Liras (€ 380). It is further reported that textile workers live under poverty line, and because of low wages and social payments qualified workers leave the sector. The staff turnover rate in Turkish textile sector reaches 37 per cent. The main disagreement in the negotiations was that employers wanted to keep special arrangements for wages which were agreed to survive during the period of crisis. This is why Teksif demanded bonuses return to the previous level of 120-day salary instead of the current 72 while the employers’ last offer was 90-day salary. Likewise, employers just offered 3 per cent salary increase while Teksif’s latest demand was 15 per cent. In his letter of solidarity message to Teksif, Jyrki Raina said, “Turkey is one of the most important and strategic countries for global textile and garment sectors. This is why success of Teksif in this strike is vital, not just for Turkish workers, but also for the rest of the world”. “IndustriALL Global Union will continue to give its full support to the striking Turkish textile workers”, Raina added. You can demonstrate your support and solidarity by sending a message to Teksif at sanartaysi@yahoo.com. Copy your messages also to IndustriALL Global Union at press-news@industriall-union.org. August 20, 2013: A dispute between Minera Frisco and the National Miners’ Union (SNTMMSRM) ended on 14 August. Workers at the El Coronel mine in Zacatecas went on strike for more than two months to defend the union’s right to represent the workers for collective bargaining purposes. Negotiations on the union side were led by Napoleon Gómez Urrutia, the union’s leader and a member of IndustriALL’s executive committee, and were mediated by the Minister for Labour and Social Welfare (STPS). The most important aspect of the agreement was that the company accepted the union’s right to represent the workers for collective bargaining purposes. All workers at the mine have joined the SNTMMSRM. The company also agreed to pay 100% of the wages unpaid during the two-month strike. It was also agreed that, within 45 days, the Minister for Labour and Social Welfare should assess the amount of the profit-sharing bonus due to workers, which was one of the other main reasons for the dispute. Minera Frisco and the STPS said they would comply with International Labour Organisation (ILO) Convention 87 on the freedom of trade union organisation. The company also said it would respect the interests and rights of the workers. Union members expressed their support for Napoleón Gómez Urrutia and the other members of the national executive committee at a general meeting and the union welcomed the new members to the organisation. According to the union, the company has absolved its members from any responsibility for the damage to mine installations caused by the CROC and the union led by “corrupt” Carlos Pavón on 29 May and has said it will carry out the relevant repairs. The company also withdrew all accusations against the striking workers who decided to join the SNTMMSRM and said it will make no claims against the union. The union said it would implement the agreement reached with more than 50 mining companies in Vancouver last November to increase productivity and efficiency and promote decent work. It is hoped that this will enable Minera Frisco to improve its performance while advancing the interests of its workers. IndustriALL congratulates the union for this agreement, which benefits the workers and is relevant to IndustriALL’s trade union mission to the ITUC and TUCA due to take place in the next few days and which will seek to assess the current situation of the trade union movement and request practical measures to end violations of rights guaranteed by ILO conventions that Mexico has signed but does not comply with.